The Dodgers have been so fortunate over the years to have such incredible players wear the uniform and eventually reach the Hall of Fame. Yet there are just 10 who have left such an indelible mark on the franchise that their number is retired and of course, one of those 10 is Duke Snider. So when he passed away earlier this year, it was an obvious decision to wear a patch in his memory all season long and yet, there was so much more we wanted to do to honor one of the greatest players to ever wear the uniform – and the franchise’s all-time home run leader. One thing we had never really done as an organization was to put a logo or symbol in the grass and the idea was posed that we put his #4 in center field, where he once roamed. With lots of hard work from our grounds crew, they made it look just right. We also wanted to pay tribute to the Brooklyn club, with which he spent so much of his career, so the players wore their Brooklyn hats, a fitting tribute. Of course, we also wanted the family to be involved in the tribute, so not only did we have nearly 40 of them here at the game, we were able to incorporate many of them in the pregame ceremony. Several of Duke’s great grandchildren took the field with the Dodgers, while one of his granddaughter’s sang the anthem and his four kids threw out the ceremonial first pitch. His nephew uttered Vin Scully’s famous words “It’s Time for Dodger Baseball” and Tommy Lasorda was there to present a gift on behalf of the organization. But it was just as important to involve the fans, so we distributed Duke Snider bobbleheads as a keepsake and we lobbed a call into the Hall of Fame, which rarely lets the plaques leave Cooperstown but immediately said ‘yes’ and allowed us to give fans the opportunity to photograph themselves with the historic piece. When it was all said and done, we’re hopeful that you all, and his family, found this to be a fitting tribute to a man who meant so much to this organization and who was so beloved by so many. Were any of you on hand for the ceremonies and did you get a chance to take a photo with the plaque? What did you think of the event overall? Would love your feedback to see if it’s something we might do again with our friends in Cooperstown. If the Duke was still around, he’d surely choke on the quality of this ownership and management. In the meantime, I stop by the ITD periodically only to say F YOU ALL in the owners box and front office and hope YOU’RE GONE SOON. A Class act last night with the Dodgers. Too bad there are losers in this world that can’t stop the rant and appreciate how special last night was to Duke’s family and the fans. Surely the comment above comes from someone who clearly has his own issues to deal with. Great Job Dodgers…I haven’t seen an evening displayed like that for a great player since Yankee Stadium in the 70’s. Judging by the very low attendance at Dodger Stadium this year, there are a lot of people that agree with messagebear. The sooner Frank McCourt is no longer the owner of the Dodgers, the better. If Frank McCourt stays as the owner for much longer, what will become of the Dodgers great legacy? Perhaps in 2050, we will have an evening dedicated to the memory of Eugenio Velez (aka Eugeni-O-for-ever). Don’t support the McCourts. Boycott the McCourts and run them out of town. 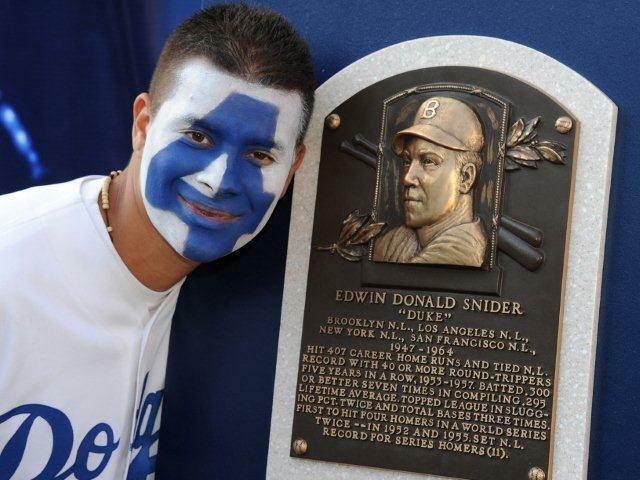 The Dodgers honored Duke Snider plenty of times when he was alive. Read http://behindblueyes.mlblogs.com/2011/03/05/from-compton-to-cooperstown/ to see all of the occasions when Snider was celebrated. A great night. I remember my Uncle giving me a autograph baseball from the Duke. You see Duke played for my Uncle in Compton before signing with the Dodgers. Long live the Duke. The Dodgers had a Duke Snider night back when the team played in the Coliseum. I think it was 1961 and as I recall, they played a doubleheader and honored Duke between games, showering him with all sorts of gifts. And, if my memory serves me, Duke played in the second game and hit a home run. I did have the honor of meeting Duke at Dodger Fantasy Camp some years ago and take batting tips from him. I was there last night but missed the opening ceremonies due to traffic on the way to the game. The fans in L.A. never saw Duke at this best but I am grateful for being able to see him at all. It’s great to see the Duke honored. He was one of the greatest hitters the Dodgers ever had and I’m glad to have the privilege of watching him play. As for today’s game, I’m happy we don’t have to face the Phillies again this year. I’m sure Frankrupt might have heard fof the Duke, but I bet it was his lame attempt to get fans into his crumbling stadium. Boycott! It’s hard for me to see it as a “lame attempt to get fans into [the] crumbling stadium”. This wasn’t just anybody, this was THE DUKE. One of the men who, if it wasn’t for him, that “Dodgers” script across the jersey’s chest would mean nothing. The organization dragged their feet on honoring him this spring as it was, I think it was AWESOME that they planned to get the Duke’s family together for this honor, and the plaque was a nice touch. Would’ve loved to take a picture with it, boycott or no boycott. I fear some people might be letting Frank McCourt get bigger than the Dodgers. I’ve disowned him. Hopefully he’ll disown us soon enough, the IRS should have Bernie Madoff and the other white collar crooks trading him for cigarettes before we know it. I agree with you about the tribute to Duke, north. Personally, I don’t associate the owner with the Dodgers anymore. When I see “the Dodgers are bankrupt”, I see “Mc***** is bankrupt”. I hope you’re right. This has all gone on way too long as it is. When the announcement is made that the team is for sale, I believe that the positive tidalwave of emotion will make all the negativity of the last few years pale in comparison. Now that the media is flooding the papers with anti-owner sentiment and it isn’t just us fans, perhaps the owner will capitulate. I’m not counting on it, but my hopes are certainly there. Kpook, I felt pretty much the same way when I read the Lopes article. What is interesting is that visiting players notice the difference as well. Lopes often looks bored sitting on the bench when the Dodgers are on defense. I hope Davey sticks around a long time but it would not surprise me if he didn’t. Of course, if Frank sees this article he won’t see it for what is really says but for what he might perceive as a disloyal club employee. lbirk, I may wear rose colored glasses, but I have to believe that once the World Series is completed Selig and MLB will blow Frank out of the water. What use is the magic bullet, “in the best interests of baseball,” if this current Dodgers disaster doesn’t fill the bill? When you and I chatted at the first ITD tour neither of us could ever have imagined what would come down in a scant two years…. It is amazing how things have changed in two years. Who would have thought is right. The ITD Tour was a major highlight of my Dodger Fan life. It would be nice to go into the Hot Stove season being FranknNedless so we can once again be part of things like that. You have inspired my latest post on Outside the Dodgers – http://bit.ly/nFigQS Click on the picture in my post to see photos of the ITD Tour. Brian, thank you for posting those pix. Ahhh, great memories! I am late here but that was great having Duke Snider’s plaque there. Good thing we alerted you to take the picture of the guy with the “4” ha? Lorena and I had met him before with different paint on. If anyone has a chance to go see the exhibition in the club level. there is a wall dedicated to Duke Snider. I’ll post my pictures when I get a chance. I attended the game Sat, August 10, and loved seeing the team play in the Brooklyn uniform AND see the #4 in the grass in the outfield! Very cool celebration! Thank you!